Have you been on any good adventures lately? Birdy will take you! 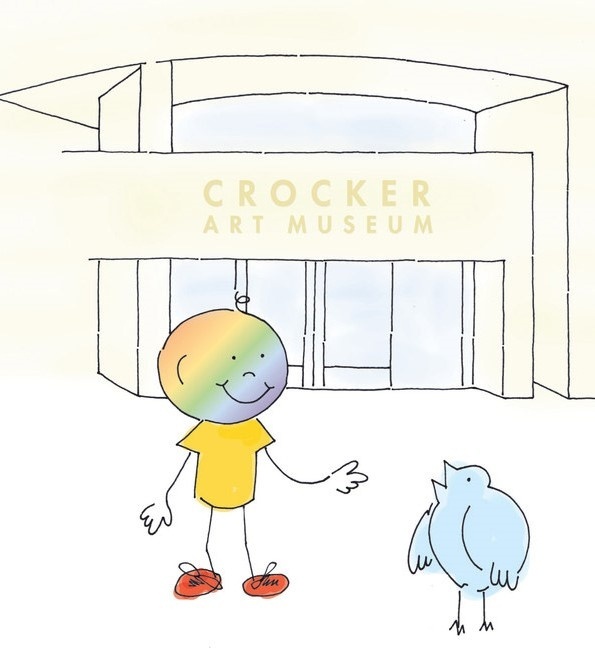 Birdy is your personal guide to the Crocker in "Birdy’s Museum Adventure", a book that invites young explorers and their adults through the museum along the Story Trail, a fun and interactive path through the museum. Designed for ages 4–6, Story Trail has two options: You can grab "Birdy’s Museum Adventure" (in English or Spanish) and take a tour of the museum with the book, looking at specific works spread throughout the museum, while spotting different birds depicted in the pieces within the book. This is a great way to engage with art and practice literacy skills. Alternatively, the Story Trail quilt is another engaging option for visitors with young ones, and includes an adventure-filled quilt with pockets stuffed with activities for each stop along the map. This can take a bit longer than "Birdy’s Museum Adventure", so if you’re on budgeted time the book might be the way to go. However, if you are looking for a productive and interesting way to spend an hour or more, the quilt is ideal. Questions like, “What do you see” are taken further with quilt activities, like in the Asian Gallery as the cards ask your little explorers to look at how the people in the art are portrayed: Are they standing or sitting? Why are their arms positioned like that? Critical-thinking questions like these inspire movement and interaction with the art. Pick up your Story Trail book or quilt at the Story Trail Kiosk this holiday season, and take the youngest members of your family on a kid-approved expedition around the Crocker. Story Trail is available year-round, and if you don't see the kiosk, the friendly people at the front desk will be happy to provide you with a copy. Check out Story Trail and other fun kid-friendly activities at the museum here!